I’m selling a couple of pieces of Canon camera gear that I no longer need. I have priced these to move! I don’t need three cameras, so selling this one that was largely a backup. I just had the LCD screen replaced because of a scratch. While at Canon, I had them go over the camera and clean the sensor – they say everything is up to spec. I have only taken a couple shots in the house with it since returned just to make sure it works. There are a few scuffs on the bottom corners, but otherwise in good shape. I would be more than happy to email photos. It has just under 25,000 clicks on the shutter. I will include an extra battery for a total of two, battery charger, cap, strap, original box, manual and warranty card. This is a super sharp, fast lens! There are a couple of nicks on the leading edge of the barrel, but otherwise it looks nearly new. I also have the case, hood, cap, original box, manual and warranty card. Again I would be happy to answer questions or provide images. I’m a bit embarrassed by all the photography gear I have accumulated over the years, and I have decided to purge some of it. Some was duplicate thanks to my foray in 3D, but much of it was slowly replaced or not used and has just sat on a shelf. I’m going to put it on Ebay, but they want 10% of the action, so I thought why not discount the gear and offer it here first. I’ll have them here for a week or so. Except when noted, I have everything including the original boxes, manuals, cloth bag and caps. I purchased all this gear new and I’m the sole owner. Shipping is extra. 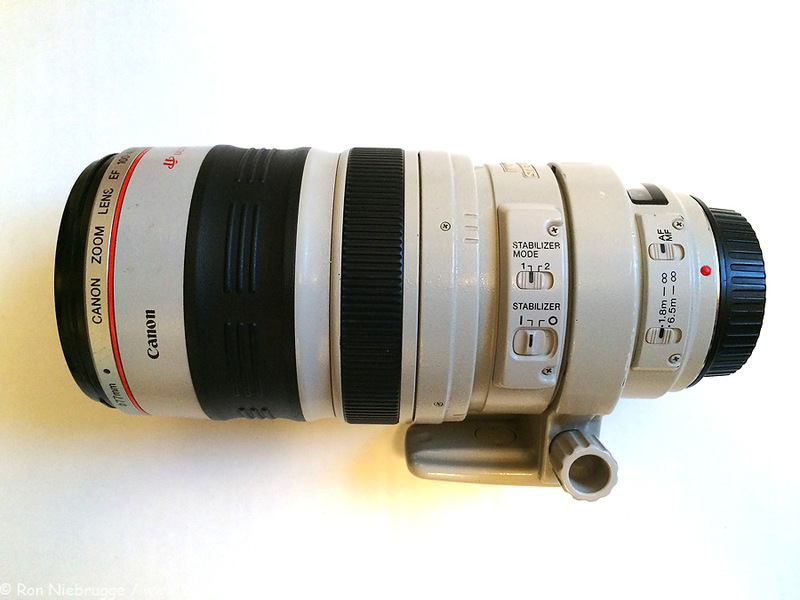 Canon 100-400 IS. Sold Just spent over $400 at Canon Professional Services having the lens completely gone over in which they replaced the lens assembly and image stabilizer. There are some minor nicks on the body, but the glass is in great shape. Looks like they go for $900 to $950 on Ebay, I would like to get $800. Canon 24 f/1.4 II. Sold I have only owned this lens for a year and a half or so, and used it only a few times. It is in great shape and cost $1,650 new at B&H. I would like $1,050. I am missing the manual on this lens, although it is available for download on-line. Canon 28-70 F/2.8 Sold Couple of small nicks on the front edge of the filter ring, but not on the threads – filters still screw on smoothly. Fast lens, nice for night photography. $500. Gitzo 1548 This is a huge carbon fiber tripod. It is older, but in decent condition. I don’t have the boxes or manuals for it. $350. Original Whiberley Head. Sold Lots of nicks and scratches, but it is still nice a smooth in operation. $250. If anyone is interested in any of these, I would be happy to answer questions or send photos. We can take Visa, MC or American Express. The new GoPro.com camera has to be at the top of the list! This tiny camera really is incredible. It can do HD video, even 1080 HD at 60 frames per second! 4K video at 15 fps. It can take still photos and time-lapses at 12 megapixels. It is water proof, has wifi built in for remote use – even a large camera with these capabilities would have cost a fortune until now. This camera just came out, and I’m sure any photographer you know could think of a million uses and could have a blast with this thing! Petzl E99 PG Tikka XP 2 Headlamp. I really like this tiny little light weight headlamp because it at 80 lumens, it is super bright! Because it is so small and light, it always stays in my camera bag, and sure comes in handy on the pre sunrise / post sunset hikes that photographers are often forced to make in the pursuit of light. But, the thing that really makes this one sweet for photography is the addition of the red LED light. The red light allows you to see your camera gear in the dark without messing up your night vision – perfect for night photography of star trails, northern lights etc. LED Keychain Micro-Light I love these little things and usually keep one on the zipper of my camera bag, and on my jacket. Gee, I’m noticing a light theme here – fitting for winter in Alaska. Leatherman 830039 New Wave Multitool There is a reason you see these on the belts or in the pockets of many Alaskans – this all around tool comes in really handy! I have been carrying mine in my camera bag for many years – this is the new and improved model of the old one I have. I have gotten so used to having it in my camera bag that I made the mistake of leaving mine in my bag as I went through security at the airport – whoops! Little Hotties Hand Warmers 40 Pairs This time of year you can’t have too many chemical hand warmers – I always leave a pair or two in my camera bag. Not only are they great for rewarming hands once they get cold – gloves are ineffective at warming cold hands, but, I will also put them in the pockets of my jacket and use this as a place to rewarm and replenish camera batteries if I’m in real cold weather. Reflectors and defusers Most photographers can’t have too many of these. They are great for close-up work and people photography. You can get them in all different sizes – something for every budget. Digital frames Most photographers love to share photos with family and co-workers, and having a nice digital frame for the office or home makes a great gift for most any photographer. I can’t recommend a particular one as I don’t own one, but I have found the buyer feedback on Amazon to be pretty accurate. iPad I know I love mine and what gift list would be complete an Ipad on it. These can be very helpful and provide a nice running head start for photographing any location. I like to try to find my own “hot spots”, but there is nothing wrong with getting some help finding the existing ones. 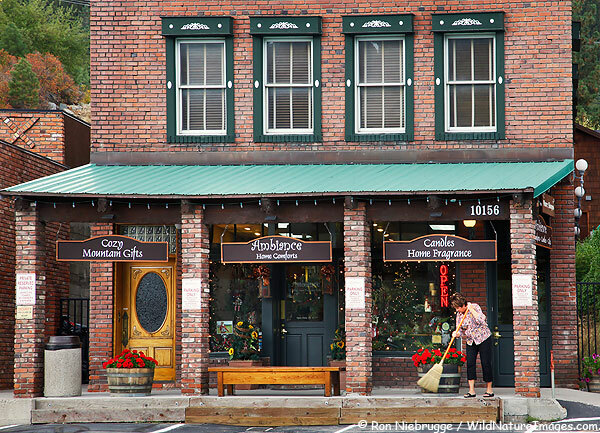 Photographing California – Vol. 1: North – A Guide to the Natural Landmarks of the Golden State I haven’t seen this brand new guide book yet, but the author, Gray Grabbe is an old friend who I have meet up with over the years everywhere from Jackson Hole Wyoming to Palm Springs – I know Gary did an awesome job and I’ll be picking up a copy for myself. Wild in Arizona: Photographing Arizona’s Wildflowers, A Guide to When, Where, and How Colleen Miniuk-Sperry is another friend of mine and I do own this book – it is excellent! I wouldn’t go without it if I was going to Arizona. I could probably do a whole new section on just ebooks – they are definitely the way of the future. To start with, pretty much any thing published by Guy Tal would be an excellent starting place – his writing and photography are both inspiring and incredible. You can find them here: Guy Tal Guy is another old friend who I have spent time photographing with in his home state of Utah. Petzl E99 PG Tikka XP 2 Headlamp. This is the newest addition to my camera bag and I love it! This tiny little light weight headlamp is super bright! At 60 lumens, it is currently the brightest Petzl headlamp. Because it is so small and light, it always stays in my camera bag, and sure comes in handy on the pre sunrise / post sunset hikes that photographers are often forced to make in the pursuit of light. But, the thing that really makes this one sweet for photography is the addition of the red LED light. The red light allows you to see your camera gear in the dark without messing up your night vision – perfect for night photography of star trails, northern lights etc. Little Hotties Hand Warmers 40 Pairs We just purchased a box of these a week or so ago. This time of year you can’t have too many chemical hand warmers – I always leave a pair or two in my camera bag. Not only are they great for rewarming hands once they get cold – gloves are ineffective at warming cold hands, but, I will also put them in the pockets of my jacket and use this as a place to rewarm and replenish camera batteries if I’m in real cold weather. An Anza-Borrego photo workshop with me. Hey, why not? Handheld GPS This is another great tool for the photographer. Not only do these things tell you where you are are, but are handy for sunrise / sunset times, tides, moon rise / set times, moon phase, and many other things. The one I use is an old Garmin that is still going strong – so I can’t recommend a specific model, but there is a wide array of choices to select from. iPad I don’t have one so I don’t have much to add, but what in 2011, what gift list would be complete without this item listed. I have always loved photography books, and although I haven’t purchased one in some time, here is a list of 4 Star rated books on outdoor photography at Amazon. 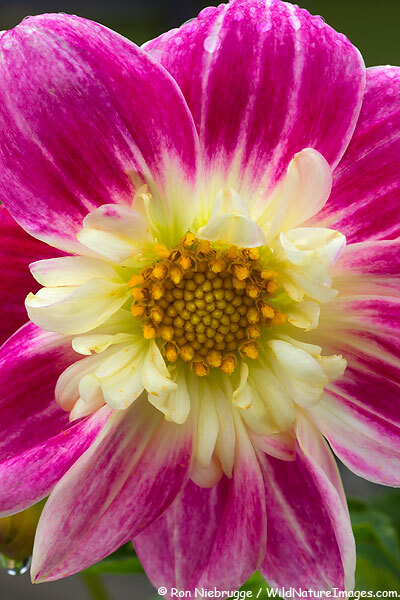 Dahlia photo with a Canon Rebel T2i and 100 Macro at f/11, 1/15 second and ISO 100. About a year ago I wrote a post on sensor cleaning for digital cameras. What I didn’t say at the time – I was really hoping I would be cleaning my sensor for the very last time because I was going to begin testing a prototype product that would protect the sensor from dust. Well after one year I’m beginning to think I may never need to clean my sensor again! I love this product! Unfortunately, it hasn’t been available to the public until recently so I had to wait until now to write about it. The main advantage is clear – by sealing off the chamber I am able to prevent dust from ever reaching the sensor. I should add, before installing, I went to great lengths to completely clean the chamber including the sensor and mirror – otherwise every time the mirror flipped up and down I was afraid it would just reposition existing dust, possibly onto the sensor. When working in a dusty environment the camera is still going to pick up dust, but now it lands on the Dust Shield instead of the sensor. The selling point behind the Dust Shield – it is far easier to replace the shield then clean the sensor. But here is an advantage I didn’t anticipate. What I found is dust was far less likely to show when on the Dust Shield. I believe this is because the dust is now landing a fair distance away from the sensor, it just doesn’t create ugly black spots like it does when it lands on the sensor. I’m always surprised at how little spots or scratches on filters aren’t viable on the final image – I believe the same principle is at play. When it does get dusty, the Dust Shield is far easier to clean then the sensor – usually a couple of puffs from a hand held blower and I’m good to go. Of course I know what everyone is thinking – what does it do to image quality? I gotta admit, I was skeptical. Having spent some $8,000 on one of the finest cameras available, and a bunch more on top quality lenses – I did not like the idea of now adding a piece of film to the image path. My photos are our sole source of income, I just can’t sacrifice quality no matter how convenient! I had to be sure image quality didn’t suffer – here is my review. I felt the best way to really test this product is with my absolute sharpest combination of equipment. So I mounted what I think is my sharpest lens, my Canon 100 macro, on my best camera, a 21 mp Canon 1DsIII. I used the two second timer with mirror lockup with a f-stop of /8, – probably about as good of a combination as I could get. I then mounted the whole thing on a monstrous Gitzo 1548 tripod, placed a bean bag on the camera and photographed a dollar bill taped to the wall. If I couldn’t detect softness with my best setup, then I’m not going to see it with say a lessor camera or with a softer lens like the 100-400. 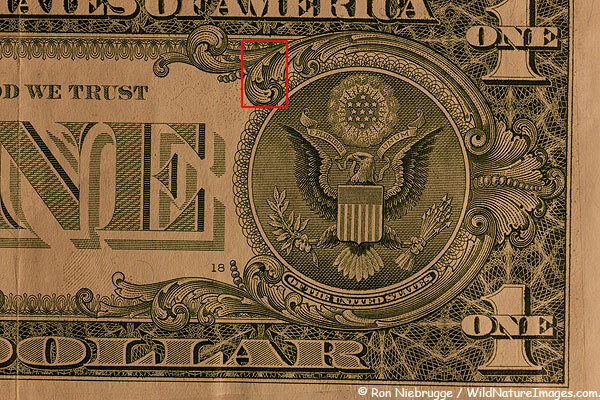 Full frame version of the dollar. Arches Photography guide application for iPhone and iTouch. Well I must admit I am a reference material junkie! I have shelves and shelves of books – guide books to National Parks, birds and animals, plants and wildflowers, animal tracks, geology… The list goes on and on. Not only do I have a bunch of book here, but I also keep many more in our trailer, and we usually send a box back and forth depending where we are traveling. Unfortunately, they take up a ton of space and weight. I also have to admit that I’m hooked on apps for my iTouch / iPhone – I have an iTouch. Maps, weather, depth of field calculators, even Northern Light predictions all on this tiny device, it is amazing! So, when I heard that a couple of friends, Dan Baumbach and Bret Edge had created an Arches National Park Photography Guide iPhone application, well I thought that was ingenious! What a great idea – I could easily travel with all this information right in my shirt pocket! A perfect marriage of information and technology. Dan recently provided me a copy to review, and I gotta admit I love the product! This application actually has a lot of advantages over a hard copy book because it is able to link to current information in real time such as weather forecasts, along with providing links to websites for local restaurants, hotels and campground – what a great resource! 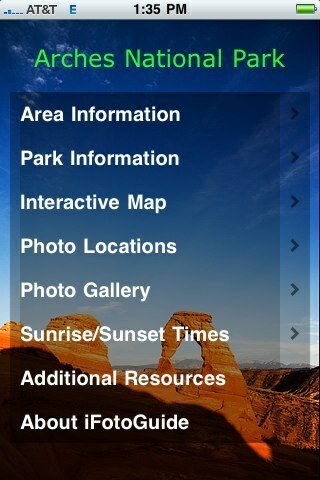 The app is also packed with all kinds of useful information on Arches National Park, information useful to photographers such sunrise and sunset times along with an interactive map and information on backpacking, wildlife and wildflowers. But the real meat to the application is the information on the different photo locations within Arches. This information includes photos, maps, descriptions on how to get to the location, even the GPS coordinates. It just so happens that I have spent a fair amount of time in Arches over the last two years, and have been to all the locations described in the app, and found the information accurate and concise. The application cost $4.95 – much cheaper then most printed guides, and more valuable. They have many more iFotoGuides planned for the future. 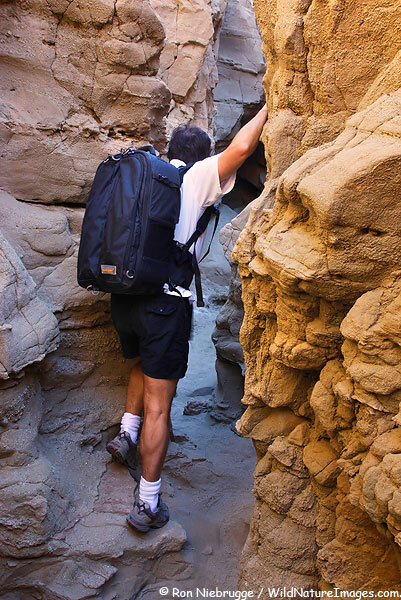 A self portrait of me in a slot canyon sporting my Kiboko camera bag by Gura Gear, Anza-Borrego State Park, California. I have been using this new bag since the beginning of this trip. I wanted to give it a complete workout in many conditions before I commented on it, but I can’t wait any longer because I love this bag! It rocks! I never thought I would be excited about a camera bag, but I am.